This is going to be one of your favorite barbecue recipes: whole bbq turkey cooked directly on the barbecue grill. Not only can it be done, it is actually pretty easy. And it tastes absolutely fabulous. It is best done with a smaller bird to ensure that it gets properly cooked all the way through. Also, when you barbecue turkey please don’t stuff it. The stuffing slows down the cooking time and makes it more difficult to ensure that it cooks through properly. Rinse the turkey thoroughly inside and out. Pat it dry. Sprinkle the inside cavity of the turkey with salt, pepper and your favorite turkey seasonings. (Look here for our lemon pepper rub recipe). Preheat your barbecue grill to medium. Place the turkey roasting pan on the grill. Close the lid and roast for 20 minutes, then lower the heat to medium-low. If you have a barbecue with a temperature setting, keep the temperature set at between 325ºF-375ºF. Tent the turkey with aluminum foil to prevent it from over-browning. Baste your bbq turkey every 15-20 minutes. Add more water to the pan if it dries out during cooking. There should always be water or juices in the pan. When it is perfectly cooked, the turkey meat may have a slight pink tinge. Just make sure it is cooked near the bone. Turkey is cooked when the breast meat reaches 170°F and thigh meat reads 180°F. Do note that the cooking time of barbecues vary depending on their size, their brand and their age. Cooking times on a barbecue can also vary depending on weather. For example, damp weather, cool weather and wind can affect cooking times, usually making them longer. Serves anywhere from 8 to 15, depending on the size of the bird. 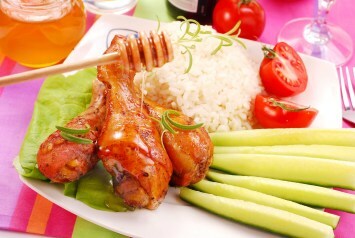 Barbecue turkey is a very lean source of protein and suits so many specialized diets. If you need gluten free recipes, low carb recipes or diabetic recipes, this turkey recipe suits them all perfectly. If you like this recipe, I’d love you to Pin it to Pinterest, Tweet about it, Like it on Facebook and leave a comment and your own favorite recipes below. Thanks. 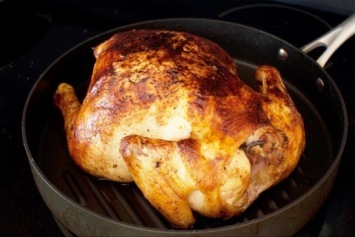 If you love this bbq turkey, find more delicious barbecue recipes here.